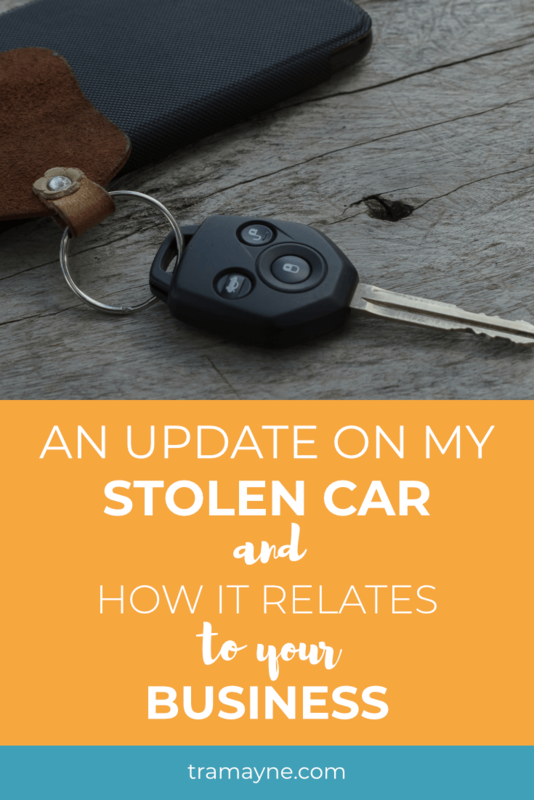 An update on my stolen car… and how it relates to your business systems - Selena Tramayne, Ph.D. Some lovely person stole my car over Thanksgiving last year. I wrote about it then (read it here if you missed it). I’m sharing an update because there are plenty of business lessons that can come out of this experience. First, the cops did recover my car. Unfortunately, it had been stripped quite a bit. So much so that the insurance company wasn’t sure it would be salvageable. While the employees at the insurance company were quite pleasant to deal with, it ended up being a bit of a cluster because of the company's lack of solid systems. I have some theories on this that I’ll share in a moment. I notify the insurance company that someone has stolen my car. The rep in Phoenix asks me to come into the Albuquerque office where I live to sign some papers. When I get to the local office, they ask for both sets of keys. Since this is the first I’ve heard of this, I only have one set, which turns out to be a blessing as you’ll see in a moment. The cops recovered my car about a week later. Since it’s Saturday, my insurance rep isn’t in, so I call the main insurance line. The woman on the line tells me she has no idea what to do and just puts a note in my file. On Monday, I email the insurance rep in Phoenix and let her know that my car has been recovered. She tells me I have to go to the tow yard to sign off on the car so they can take it to get it assessed. And while I’m there can I take pictures to send to her. The insurance company takes care of getting the car from the tow yard to the body shop for assessment. On Tuesday, I get a voicemail from the Albuquerque insurance rep telling me my car is at the body shop and can I please come in to assess the damages. I call her back and let her know that I’ve already seen my car, taken pictures, and sent them to the insurance rep in Phoenix. She says okay and lets me know that it will take about a week to get my car back. The following Tuesday (a week later), I get a voicemail from the Albuquerque insurance rep letting me know that my car won’t be ready tomorrow. But IT WILL be ready on Thursday. Since I hadn’t heard from anyone that it was going to be ready on Wednesday, Thursday seems fine to me. Wednesday I get a voicemail from the body shop letting me know that they’re ready to start working on my car. But they can’t start because the keys weren't with the vehicle. [of course not, it was stolen] Remember, that I’ve been told by the insurance rep that my car is supposed to be ready the next day. I call back that day and leave a message that I gave my keys to the insurance company and they should have them. Thursday afternoon I call the body shop because I haven’t heard from them or the insurance company. They tell me that the insurance company doesn’t know where the keys are and they can’t do anything until they have them. I let them know that I have another set and I run them up (I learn later that my keys were mailed to the Phoenix office). Friday, I get a call from the local insurance rep letting me know that my car doesn’t just need a front bumper but also a grille. And that my car won’t be ready until Monday or Tuesday. Just to remind you, it is now a day after when I was supposed to get my car back. Wednesday of the following week, I do finally get my car back. So why did I share this story with you? Because my gorgeous reader, there is a business lesson here. As someone who loves to help coaches build solid sustainable six-figure businesses, you can see how this whole fiasco has my business mind on overdrive. This insurance company has been around since 1937. That’s 80 years to get their systems down pat. I mean so streamlined that I could have gotten my car back within a few days after they found it since it only took the body shop a couple of days to actually fix my car. This would have saved the insurance company hundreds of dollars in rental car fees and me a lot of frustration. I have a theory because I’ve seen it in other businesses. Most large companies didn’t start out that way. They started out very small and grew organically. If companies aren’t consciously streamlining their systems as they grow, they eventually become huge bureaucratic nightmares of incompetency and waste. Once you get that big and to that level of systemic incompetence, it takes a MASSIVE effort to make significant improvements. Fortunately, your business is much smaller than the insurance company, so you have an incredible advantage. You can build “lean, mean, streamlined systems” into your company culture. Even if you’re a one woman shop. It’s too easy to put it off. Think about all the times you figured something out, got it to work this time, and didn’t write down what you did. A few months later you have to go back and do that same thing. Since you didn’t write it down, you have to pretty much start from scratch because you’ve forgotten everything. We all get caught up in that trap. Yet, if we build it into the culture, it just becomes our way of doing things. Each time you use the system you developed, think “Is there a way to make this system even more streamlined? And then you’ll just keep making the systems better and better. I hope you found my little saga informative. Previous Post How does my car being stolen relate to your coaching business? Next Post What can my first hater email teach you about your coaching business?